MKM has been asked to transform a 36 acre property in eastern Connecticut. The client has requested that their house, built 15 years ago, be more integrated into the landscape and that overall site should be more accessible. MKM divided the property into zones based on their ecological and physical characteristics, and proposed a phased approach to the overall site, always with a goal to visually integrate the architecture of the house with the land, to enhance opportunities for focused and expansive views, and to provide usability and access to portions of the property that were not being used. Some of the amendments are: terrace redesign, driveway re-alignment, meadow management, wetland plantings, grading to promote drainage, design of an entrance gate, planting an orchard, design and building of a tree house. This Berkshire estate evokes the grand residential estates of yesteryear. Stone terraces, walls and stairs are planted with herbs and creeping perennials and serve as an overlook past specialty gardens, sweeping lawns, ponds and waterfalls to distant mountain views. The Skyview on the Hudson Board reached out to MKM to provide a Master Plan for overall site unity and upgrade, with a phasing plan for implementation. 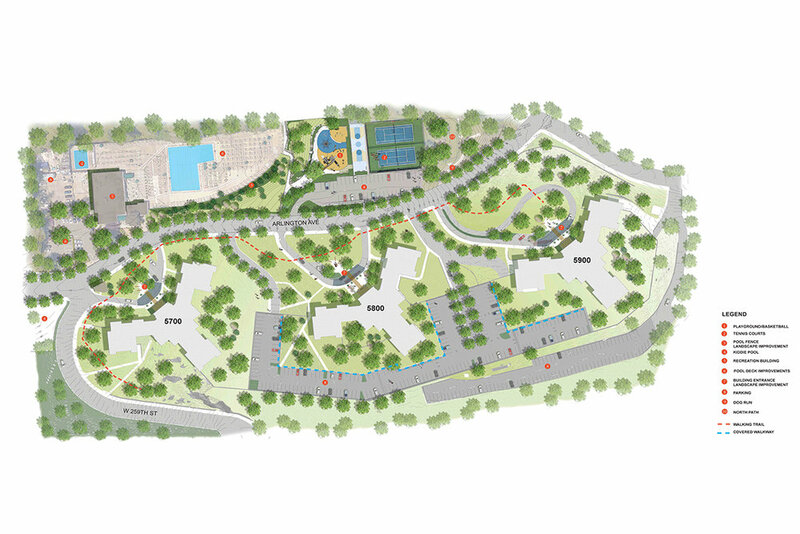 After extensive site analysis and numerous site visits, MKM provided strategies and design suggestions for the following areas: Pedestrian Circulation, Enhanced Vehicular Circulation and parking amendments, Redesign of the entrance roads and vegetated islands directly in front of the buildings. MKM is working with a client in northwestern Connecticut to develop a former summer camp into a family retreat. This fourteen acre property has three cabins, a single family home that will be demolished or renovated and numerous outbuildings that are being adaptively reused. The main architectural feature is a former lodge which is currently being refurbished. MKM has completed a master plan and is currently working on modifications to the overall site circulation, and adding various recreational venues which include a tennis court, swimming pool and practice golf area. Lastly, MKM is developing a native plant palette which will be employed to screen surrounding properties, buffer along the access road, and enhance and reinforce new site amenities. MKM designed numerous country estates in the New York metro area that allow the homeowner to experience the full beauty of their native landscape. Projects include installing fencing, driveways, pools, walkways, tree transplanting, garden beds, and perennial gardens.